~ Oil companies routinely downplay both the likelihood and the consequences of pipeline accidents and their spills that foul the environment. They want us to see the risk-reward equation as overwhelmingly one of minuscule risk, negligible impact and enormous economic and employment upside. Should we believe them? What might be the impacts if there were when there is an accident? Two new pipelines have been proposed to transport "non-conventional" oil, specifically that derived from Alberta's infamous tar sands: Keystone XL, running south to refineries and terminals on the Gulf of Mexico, and Northern Gateway, running west across Canada to terminals on the coast of British Columbia. 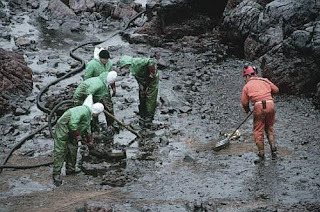 Tar-sands spills are incredibly, frighteningly difficult to clean up. And it’s this same kind of oil that would be pumped through the Keystone XL pipeline if it gets built, sent 1,700 miles right down the middle of the country, and right over the Ogallala Aquifer, a major source of freshwater for drinking and irrigation. Bitumen is so thick — about the consistency of peanut butter — that it doesn’t flow from a well like the crude oil found in most of the nation’s pipelines. Instead the tarry resin is either steamed or strip-mined from sandy soil. Then it is thinned [by about 30 percent] with large quantities of liquid chemicals so it can be pumped through pipelines. These dilutents usually include benzene, a known human carcinogen. So, what happens if it spilled? We don't need to guess, unfortunately. Enbridge, the operator of an existing pipeline carrying this noxious mixture, and the company that wants to build the Northern Gateway, had a huge spill near Kalamazoo, Michigan, 3 months after the BP Deepwater Horizon rig exploded and sank in the Gulf. 150 families have been "permanently" relocated, and at least $765M has been spent so far, and the spill is not yet cleaned up. It may never be. Officials initially estimated that the spill would be cleaned up in a couple of months. Nearly two years later, it’s still not done — and it likely never will be, because scraping up all of the oil would destroy riverbeds. The emergency response plan the company keeps on file with PHMSA is more specific. It says a rupture on the Lakehead system would be detected within five minutes and the damaged segment closed in three minutes. That didn't happen. It took days. And it wasn't Enbridge's first spill, either. Pipeline spills are common occurrences. But the public shouldn't worry its pretty little collective head about it, according to industry mouthpiece American Petroleum Institute (API) because industry is intent on working to improve its safety record. "A number of industry safety enhancement initiatives are underway that include improving recognition of, response to and reporting of large ruptures." "Safety has always been core to our operations." Yeah, right. This is not a triple bottom line business where social and environmental costs are on a par with making money. Profit is core to operations, and even hundreds of millions of dollars amount to no more than the cost of doing their dirty business. As with gun violence, each new incident as treated as some kind of unfortunate aberration, not an indication of an inherent problem that demands a much more far-reaching policy response.